Water plants: If you live in an area that is having a drought, you will have to water. With the heat of summer and the drought,depending on your plants, many will need to be watered frequently. How to water correctly is often misunderstood. A good site for information on proper watering is this. And because water is becoming more and more of a rare commodity, with a drought might come prohibitions from your township on using it outdoors on your grounds. So you will have to check with your local government to see if watering outdoors is being allowed. In times when water is rationed you might want to use what is called gray water to keep the plants alive. Gray water is the water used in your house for washing, etc. – all but toilet water. The proper usage of gray water is explained here. It is best to water before the sun comes up. It is best to soak the soil around the roots of the plants rather than to spray water over the tops of the plants. First, it saves water. Less water evaporates when you soak the root area. And for some plants, especially roses, watering the leaves can cause fungal problems like black spot – if the plants are susceptible to the disease. When you water it is best to soak the plants deeply so that the roots stay down in the soil. Shallow watering can cause roots to more upwards. See here. Weed: Plants don’t want competition in the soil. And the roots of the plants you planted don’t want to share any of the precious water you are giving them unless you are A. A, Milne of Winnie the Pooh fame who says “Weeds are flowers too, once you get to know them.” Most of us don’t want to know most of the weeds that come uninvited into our gardens. Deadhead: Unless you really want to get seeds from your plants, for more blooms on your perennials you will want to deadhead the dead flowers. (If you want to get seeds, you can let the flowers dry naturally on the plants.) See here. To make the garden look nicer, you can also cut out any leaves or branches that look like they are dying or are dead. Remember to compost whatever you cut off. 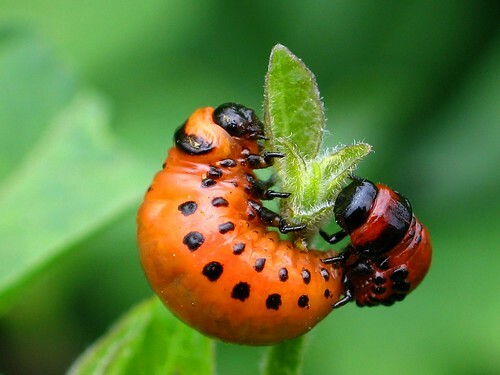 If you have a vegetable garden, look on the underside of leaves of the plants to see if some insects have laid eggs there which can hatch and destroy the crop. For example, if you are raising anything in the cabbage or turnip family of plants, you might see yellow orange tiny eggs attached to the underside of the leaf that will turn into the cabbage white butterfly. See here. If you see any insect nests on your plants, cut off and destroy these nests. Unless, of course, you want the insects to hatch. For example, many people raise plants like fennel on purpose because they are the host plants of butterflies. See here. And there are those who feel that they want the cabbage white butterflies, so they are willing to share their crop and not kill the eggs. If you have roses, you might be seeing Japanese beetles eating your rose flowers. Do NOT buy Japanese beetle traps because they are too successful in attracting Japanese beetles. They use a pheromone to attract the Japanese beetles to the trap which is so alluring that it will also attract all your neighbors’ Japanese beetles to your property. You should hand pick them in the morning when they are sluggish and drop them into a pail of soapy water. See here. I have read that you can make your own Japanese beetle trap. See here. I have never tried this home made trap. If you have, please let TheGardenLady readers know if it is successful.